Old Pulteney has unveiled the third edition of its Flotilla vintage, which will be exclusively available in France. The release is limited to 12,000 bottles that have been matured in American oak ex-Bourbon barrels. It follows the launch of Flotilla 2000 and Flotilla 2004. “French whisky drinkers are very important to Old Pulteney and we are thrilled to be launching another Flotilla vintage especially for the French market,” said Margaret Mary Clarke, senior brand manager of Old Pulteney. “The Pulteney distillery team in Wick have crafted a superb vintage expression that has all the distinctive qualities of our award winning malt with the special vintage notes and flavours which we know our drinkers in France will love. 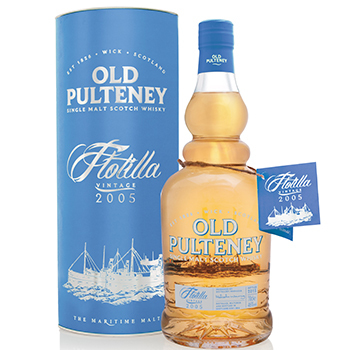 Said have a flavour of tropical fruits, ground spices, citrus and salted caramel, Old Pulteney Flotilla 2005 has been bottled at 46% abv and carries an RRP of €54.00. Earlier this month, Old Pulteney added a second peated vintage to its Scotch portfolio with the launch of Old Pulteney 1989.